Total Agenda – Powerful Task Management (Application) — Mobers.ORG — Your Daily Source For Mobile FUN! 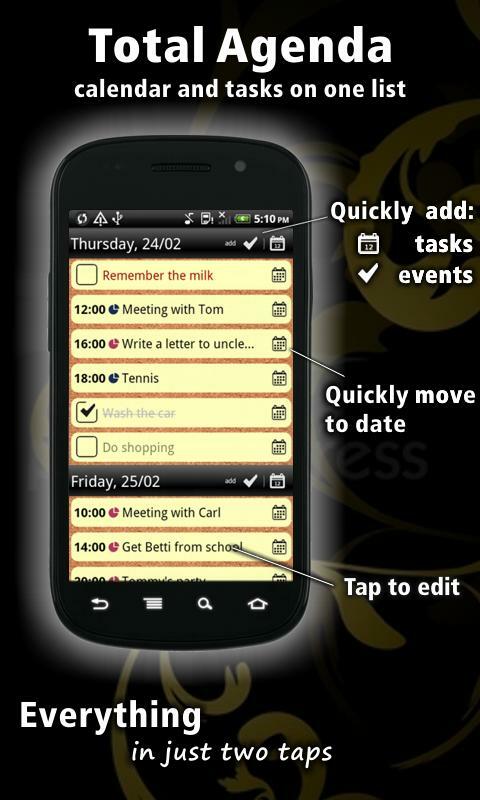 Total Agenda, a powerful time and task management app, designed and develop to answer everyone’s need. Perfect for those who live in tied deadline, busy schedule and need to get fast access to their daily schedule quick. With its simple menu that needs only simple tapping to view, edit, delete and add today's event and entry, Total Agenda offers comfortability to manage daily activities perfectly. The app is free download in Android Market, and you can get the app within minutes. There's alarm reminder for upcoming events, and you can easily sync the app with Google calendar & task.